It was recently announced that Cowley College has been named a Gold-level Military Friendly® School Award recipient for 2017. For more than a decade, Military Friendly® ratings have set the standard for companies and colleges demonstrating positive employment and education outcomes for veterans and their families. 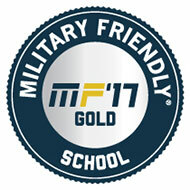 Companies and schools had to successfully complete a 2017 Military Friendly® survey and been designated as a 2017 Military Military Friendly® School to be considered for the Awards program. The names of awardees will be printed in the December issue of G.I. Jobs® or Guide to Military Friendly® Schools.